Ken Koeppen, a 34-year veteran of the Fire Department, has been appointed Arlington Heights Fire Chief effective immediately by Village Manager Bill Dixon. Ken Koeppen has been serving as Acting Fire Chief following the February 2014 retirement of former Chief Glenn Ericksen. Ken Koeppen has served in several leadership roles within the Department including Deputy Fire Chief since 2005, Fire Commander from 1998-2005 and Fire Lieutenant from 1995-1998. Prior to Fire Lieutenant, Ken Koeppen served as Firefighter/Paramedic since joining the Department in 1980. Most recently, Ken Koeppen was honored with the Police Department’s Lifesaver Award on March 20 at the L.W. Calderwood Officer of the Year banquet. He received the award in recognition of his quick action in rendering aid to Officer Michael McEvoy who was shot in the face during a hostage situation that occurred on December 12, 2013. Koeppen was visiting family at a nearby home when he noticed flashing lights. When he ran outside to offer assistance, he saw Officer McEvoy lying unconscious on the ground. Ken’s integrity and his leadership skills in cultivating a strong working relationship with Fire Department personnel as well as personnel in other Village Departments made him an exceptional choice as our next Fire Chief,” said Village Manager Bill Dixon. Koeppen is the Village’s fifth Fire Chief since the fire department changed from a volunteer department to a full-time paid Fire Department in 1958. 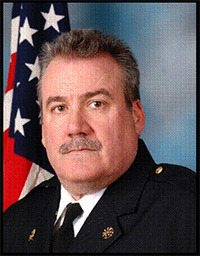 During his tenure, Ken Koeppen has supervised, trained and evaluated Fire Department staff, implemented and managed operational procedures of the Department, oversees arson investigations and responded to a variety of emergency and non-emergency situations including fires, medical injuries and illnesses, and hazardous material spills. Ken Koeppen, his wife and son, live in Arlington Heights. “I have established roots in this community and as Fire Chief I will constantly strive to provide the very best service to our residents,” said Ken Koeppen. “I am excited about the opportunity to lead our Fire Department and to continue to provide the level of excellence that our residents deserve. The Arlington Heights Fire Department consists of 110 employees and provides residents and businesses with fire protection service, emergency medical services (EMS) and other rescue functions. The Department consists of four Divisions – Administrative, Fire Suppression, Emergency Medical and Training.